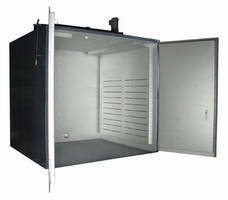 Industrial Walk-In Ovens offer various heating arrangements. Able to be heated by electricity, steam, or any type of thermal fluid from room temperature to 500Â°F, Sahara Walk-In Ovens come in sizes and heating arrangements to meetÂ diverse application requirements;Â custom builds are also available. Available options, among others,Â include customized companion trucks/carts, exhaust vent with damper, interior door latch, chart recorder, door switch, adjustable timer, Ethernet or serial bus communication, and integrated PLC controls with touchscreen. Benko Products, Inc., a leading innovator in the process heating industry, announces its Sahara Walk-In Ovens that offer a range of options and heating arrangements. Sahara Walk-in Ovens are available in a range of sizes and heating arrangements to meet a variety of applications. Temperatures can range from room temperature to 500°F. Benko Products is not restricted to standard model sizes and instead, will custom build an industrial oven to your specifications. Sahara Walk-in Ovens offer a range of options such as: companion trucks/carts built to your specification, exhaust vent with damper, interior door latch, outdoor use package, chart recorder, door switch, adjustable timer, Ethernet or serial bus communication, integrated PLC controls with touch screen and more. Electric, steam or any type of thermal fluid may be used for heating. Sahara Walk-in Ovens are just one of many industrial ovens offered by Benko Products. Other oven types offered include batch, conveyor, cabinet, drying, truck-in, curing, drum/tote warming ovens and more. Benko Products has been manufacturing Sahara Industrial Ovens for 30 years and has thousands of ovens successfully operating in the field today. A two-year warranty is offered on all ovens. For more information on the Sahara Oven line, contact Benko Products, Inc. at (440) 934-2180 or go to www.benkoproducts.com. Benko Products, Inc. is a privately held company based out of Sheffield Village, OH. Benko Products was founded in 1983 by pioneer John Benko, the inventor of the Sahara Hot Box® drum warming oven. Benko’s leading product lines include industrial ovens; G-RAFF safety platforms; mezzanine safety gates and chemical storage systems. Benko is also the parent company to GREEN Access & Fall Protection, a leading manufacturer of gangways for tank trucks and rail cars as well as self-leveling stair applications.